Today were going to talk about why ‘rentvesting’ can help first home buyers. For those who have never heard of the term rentvesting. It simply means you continue to rent, while you invest in property. You may think how is that even possible? How can you afford to pay rent and a mortgage at the same time? This strategy is ideally suited for those renting in prime locations, but can’t afford to buy in that same location. So instead of waiting 5 or 10 years to buy. You start to build a portfolio in the meantime, whilst you continue to rent where you like. I’ll give some brief numbers for simple understanding. Let’s say you pay $400 per week in rent. Assuming no vacancy, an investment property costing $500,000 will likely cost you about $100-$150 per week to hold. Therefore you would need a minimum of $500-$550 per week to rent and invest. On top of that you would need the deposit (usually 10-20% of the purchase price) and stamp duty to purchase the investment. One of the key benefits of this idea is you buy in locations which will likely outperform where you live. At the same time you diversify your future investments, taking advantage of differing growth cycles. Then when your ready to purchase your own place to live in. You can either sell some or all of the investments. Or hold onto them and borrow against their value. Today we’re going to talk about how long a property takes to go from being negatively geared to positively geared. Firstly, most properties are negatively geared when they start out. This means you spend more on the property than you receive in income. The opposite is positively geared. Meaning the property effectively pays you to hold it i.e. the income generated is greater than the cost to hold the property. Historically, as time goes by, rents usually increase. Based on estimated SQM Research figures. In Sydney this has been approximately 25% over the last 10 years. On a $500,000 Sydney property this would be about $9 per week, per year. Another thing you will often hear, is your property yields 4%. Only to think to yourself, I have no idea what that means! Well, I’m here to try and explain what a yield is. It’s a term used to describe the percentage return you will receive based on your purchase price. For example, a 4% yield on $500,000 purchase price means $20,000 return per year. Or a rental of $384 per week. Let’s assume the interest rate for your mortgage you have is at 4.5%. Which means you are paying $22,500 per year in interest repayments to the bank. This means you are $2,500 out of pocket or $48 per week. There is also council rates, fixed water rates, property managers fees, maintenance, potential strata rates and other miscellaneous costs. For simplicity, let’s assume these all come to $5,000 per year. This means you currently earn $20,000 per year with no vacancy. You currently spend $27,500 per year on expenses. Therefore you currently are $7,500 per year out of pocket or $144 per week. What happens over time is rents usually increase. Let’s assume at a rate of 2.5% per year or $9 per week, per year for simplicity and to help in your understanding. In year 2 this $144 would go down to $135. And so on until it becomes positive in year 18. 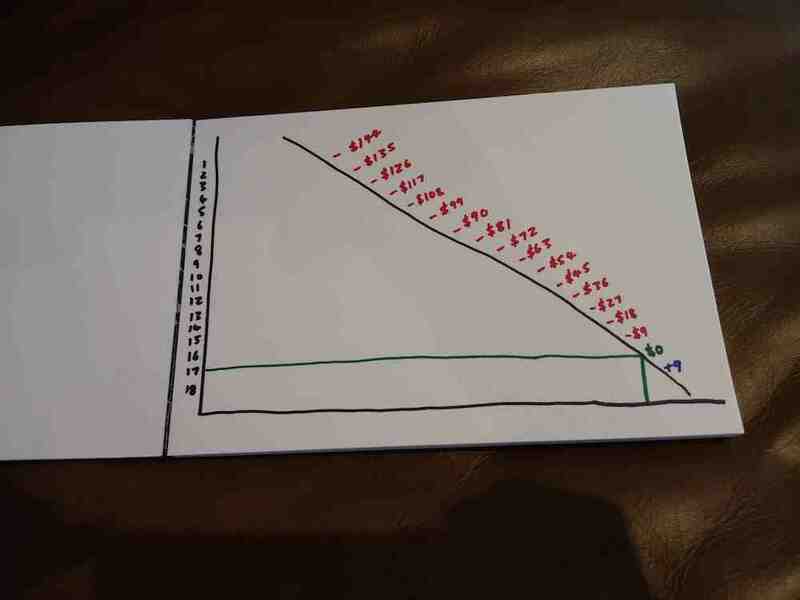 This basically drawn diagram shows, shows how a property becomes cash flow positive or positively geared in year 18, meaning the property is effectively holding itself in this example. There are variables like interest rates which fluctuate both up and down which can affect the cash flow. In some years they won’t increase as quickly as these figures and depending on the location of the property there can be times of vacancy. Today were going to talk about whether it’s better to buy one expensive property or two cheaper properties when investing. Isn’t more of something better? More food, more time, more money! Therefore, wouldn’t more property be better? Well, this really depends on what you are trying to do in my opinion. Someone with a keen architectural eye, who wants to invest in a prime inner city suburb and oversee the renovation themselves. Is very different to someone looking to build a property portfolio, through buy and hold and potential value adding strategies into the future. The inner city renovator isn’t just an investor, they have an emotional connection to their property. They get satisfaction from the process and any money made is a bonus. Whereas the person wanting to build a portfolio, is purely interested in the numbers and return on investment. I would argue it would make more sense to diversify on two cheaper ones, than one large purchase. My argument is based on markets growing at different rates. Therefore if you can pick the best markets, it makes sense to have more properties in these markets. More property means multiple things when investing. It means you can liquidate or sell a property in your portfolio in the best performing market when required. It means your portfolio will take advantage of differing growth cycles. It means your rental returns or yields will often be higher than the expensive property. One important point is I wouldn’t recommend just buying any cheap property for the sack of it being cheap. The property needs to make sense for the local market, and meet the demand of the local community. For example a 1 bedroom unit in an area with 80% families, will probably not make too much sense.